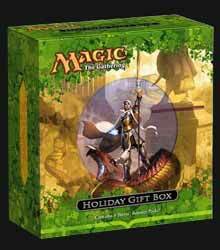 Magic's 2013 Holiday Gift Box is the perfect present for any Magic fan you know... or yourself. Not only does it contain a few items that you'll find of use, but it also acts as an attractive storage box to keep all of your cards in good condition. The box is designed to hold 2000 Magic cards. It comes complete with four Theros booster packs; twenty Theros basic lands; six illustrated plastic dividers; a sticker sheet to allow you to customise the dividers; and an alternate-art Karametra's Acolyte from the Theros set. While not an essential purchase for fans, it is an interesting way of keeping your decks in good condition and allows you to store them all away in one neat space.